ARLINGTON, Va. — Arlington National Cemetery, final resting place for thousands of American soldiers and others who have served and sacrificed, isn't just about the history of war. Yes, the rows and rows of white headstones tell war stories across the generations, honoring young soldiers killed in action as well as veterans who lived into old age long past their military service. And yes, there are memorials here marking tragic moments in American history, including a tribute to the astronauts who perished when the Space Shuttle Challenger exploded and the eternal flame at the grave of President John F. Kennedy. But while tourists make up many of the 3 million to 4 million people who visit Arlington National Cemetery each year, there are plenty of mourners here, too. More than 25 funerals are held here each weekday and another half-dozen on Saturdays. Here are some basics for planning a visit to see some of Arlington's most notable sites while honoring those buried here. 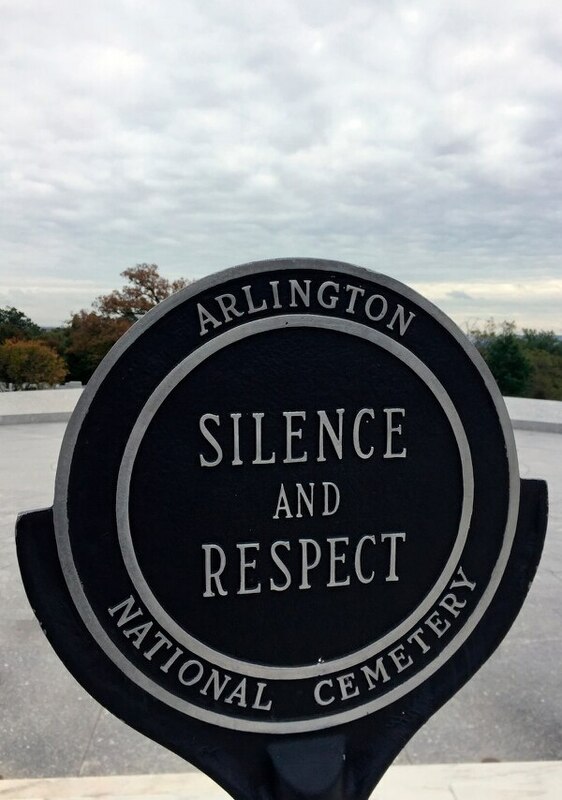 A "Silence and Respect" sign at Arlington National Cemetery in Arlington, Va. Chances are as you wander around, you'll see some visitors kneeling by a grave or leaving a note or flower to remember a loved one. You may see a graveside service underway in the distance, hear a bugle playing "Taps" or be startled by rifle shots, customary for military funerals. Or you may see six horses slowly and solemnly pulling a caisson bearing a flag-draped coffin for a full-honors funeral. Signs around the cemetery bear the words "Silence and Respect," to give mourners space and privacy. Fall leaves lay among the gravestones at Arlington National Cemetery in Arlington, Va., on Oct. 28, 2010. The cemetery gets between 3 million and 4 million visitors a year. 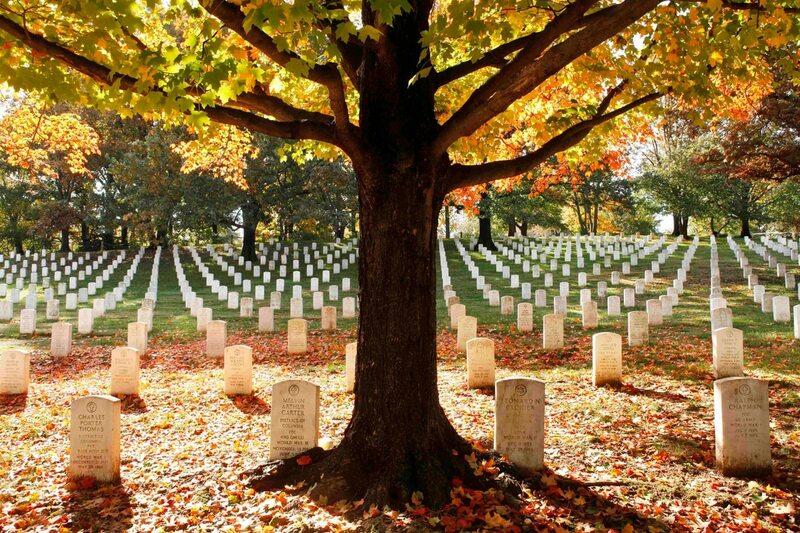 Arlington National Cemetery is open daily 8 a.m.-5 p.m., October-May (and until 7 p.m., April-September). Admission is free. Stop in the welcome center for a free map and advice on finding sites of particular interest. The cemetery is a square mile, so allow several hours for your visit. Be prepared for hills and lots of walking. Hop-on, hop-off trolleys with narrated tours offer an overview of the grounds with stops at some of the most-visited sites. Tickets are $12 (discounts for children, veterans, military personnel and seniors). The Washington, D.C., Metrorail blue line has a stop at Arlington National Cemetery. If you're driving, an onsite parking garage is accessible from Memorial Avenue. 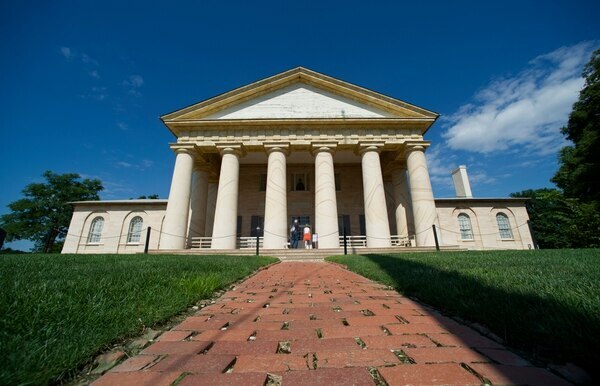 The historic Arlington House mansion is seen July 17, 2014, at Arlington National Cemetery in Arlington, Va. The historic house and plantation overlooking the nation's capital was home to Confederate Gen. Robert E. Lee. Arlington House, also known as the Robert E. Lee Memorial, is on a hilltop overlooking the Kennedy gravesite. Standing in front of the house, you can see downtown Washington with the Washington Monument's white obelisk in the distance. The Lee house, run by the National Park Service, has fascinating connections to George Washington and the Civil War. The land where the cemetery now sits was originally a 19th-century slave plantation owned by George Washington's adopted grandson, George Washington Parke Custis. Custis' daughter married Robert E. Lee, the leader of the Confederate Army. During the Civil War, Union troops occupied the estate and began burying soldiers there. Lee's family never returned, and in 1882 the U.S. Supreme Court ordered the government to compensate them. Two cabins behind Arlington House tell the story of African-Americans — both enslaved and free — who lived and worked there. The Kennedy gravesite has markers for the slain president, his widow, Jacqueline Kennedy Onassis, and other family members. JFK's famous quote, "Ask not what your country can do for you, ask what you can do for your country," is engraved nearby. 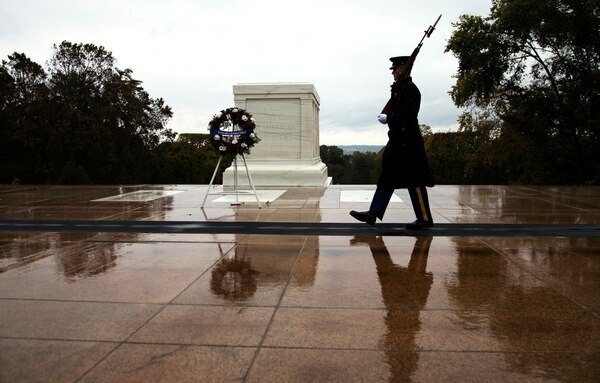 A Tomb guard walks at the Tomb of the Unknown Soldier on Oct. 22, 2014, in Arlington National Cemetery in Arlington, Va. The tomb is one of the cemetery's most-visited sites. Arlington National Cemetery is dotted with memorials. They include monuments and markers honoring veterans of various battles and wars, victims of disasters like the sinking of the USS Maine and the downing of Pan Am Flight 103, and others who served or sacrificed, from Gold Star mothers to the Coast Guard. The Tomb of the Unknown Soldier is guarded by a marching uniformed sentinel 24 hours a day, with a changing of the guard on the hour. Many famous individuals are buried here, from Hollywood actors to U.S. senators. But one of the most asked-about sites in the last few months has been the grave of Capt. Humayun Khan, whose father spoke at the Democratic National Convention in August. Khan was killed during the Iraq War, and the story of his immigrant Muslim family and their loss became an issue in the presidential campaign. Welcome center staff are accustomed to giving directions to his gravesite, No. 7986 in section 60, where visitors often leave flowers and notes. Most Arlington graves are marked with crosses, but other symbols, like the six-pointed Jewish star and a wheel representing the Buddhist faith, can be seen. Khan's headstone bears a Muslim crescent and star.